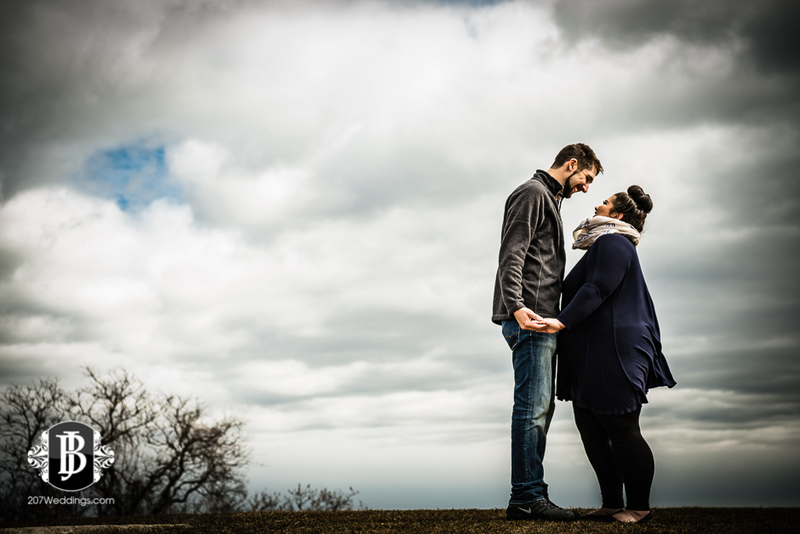 You know when someone is deeply in love when he contacts you for proposal photography and plans a full day with driving 4 hours one way just for the big moment. It's something I don't take lightly on my end, and it's an honor to even be considered in capturing it. Jordan contacted me with the wonderful story of how he and Chelsie were neighbors when they were little, then she moved away for several years. 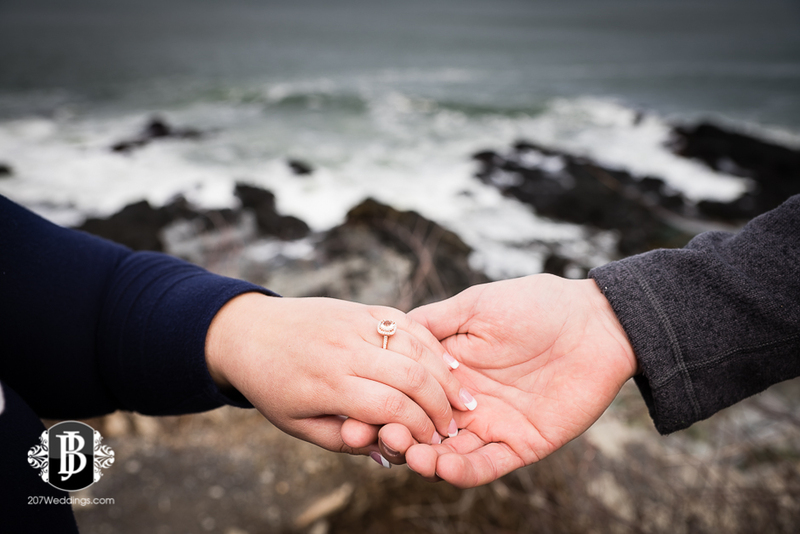 They reconnected when her family moved back in Jr. High, and they have been inseparable ever since. Now that they are all grown up, instead of falling to the wayside as puppy love often does, their love has matured right along with them. This was a their dating anniversary, which made it that much more special, and it also created a great cover for hatching our real plans! 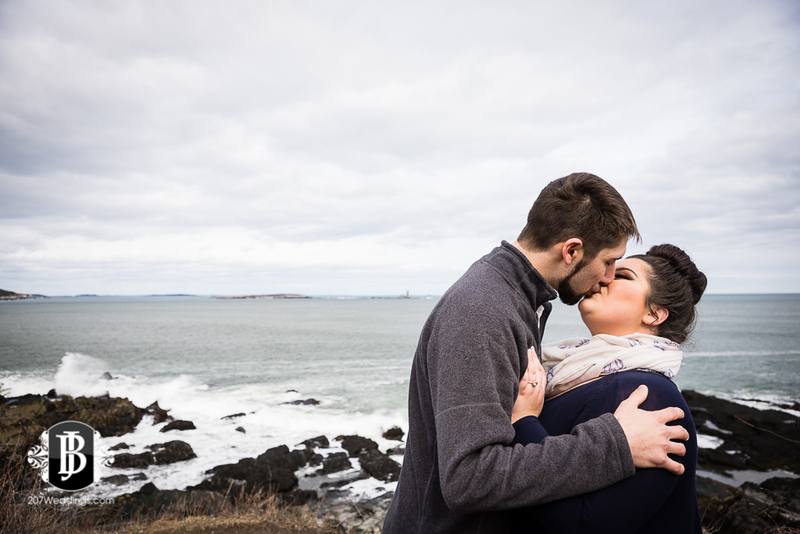 Jordan was surprising Chelsie with a couples' photoshoot that he scheduled as a present for their dating anniversary. How amazing is even that prospect, and wow did she get so much more out of the deal! 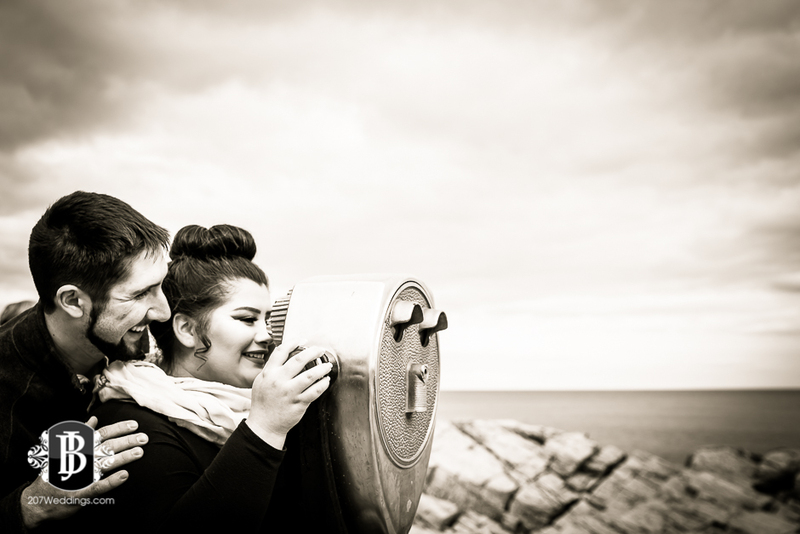 Chelsie loved some of the photos of Ft. Williams Park that she had seen online, and wanted to have their couples' session there. Perfect! 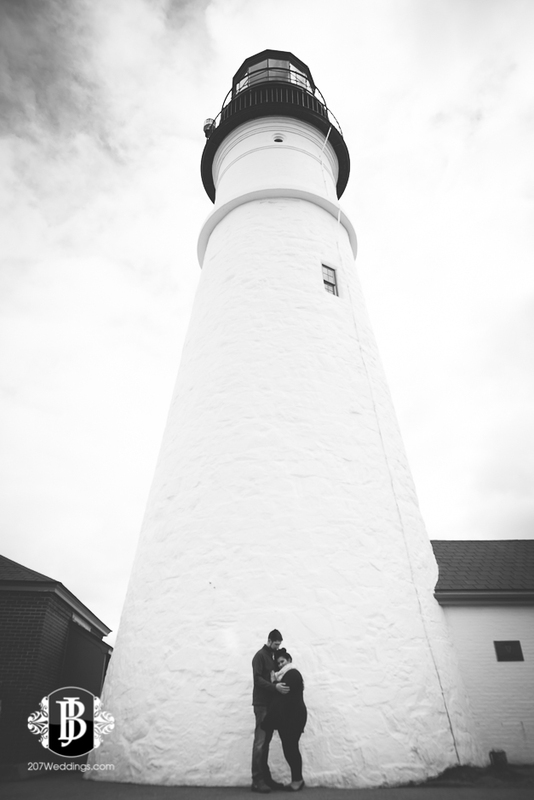 We met at the lighthouse and upon meeting them and their smiles I knew it was going to be a fun one. I led them down the cliffside trail to where they had seen some large rocks along the coast, similar to the ones they grew up around. We then carefully made our way down the rocky hillside down to the coast (and Chelsie in flats, no less! ), dodging mud and loose rocks on our way. We found the perfect rock to "begin our session", and made our way to the top. After finding good footing, I came back down from the rock and began to "pose" them for the shoot. As per our plan, I had them face the lighthouse, repositioned Jordan, and then it was go time. I gave the signal to Jordan, and he took to one knee without her knowing. He called her name to turn around, and there he was with a beautiful, red ring box, and the most stunning ring glistening inside. Chelsie immediately said, "well it's about time!". How cute is that?! Filled with love and smiling ear to ear, they took a few minutes to soak everything in and breathe. 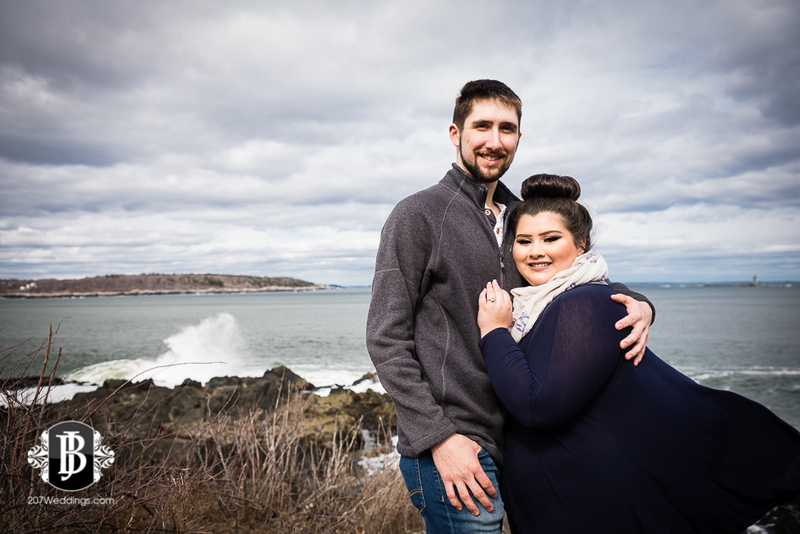 We snuck in a few shots down on the rocks, and then made our way back up the rocky cliff to start the remainder of our session. We continued all over the hill and into the little groves and overlooks and found some really amazing spots for photos. Amazing subjects, √ - Jordan and Chelsie were so amazing to work with, and fell into place so effortlessly and naturally, plus they are up for anything - it was like a dream! And the cherry on top is that Chelsie is a rockstar makeup artist - holy cow, what!? (Pst - check out her FaceBook page, like, pronto! : https://www.facebook.com/mainecoastmakeup/). Perfect lighting, √ - The lighting couldn't have been better, which is why I love shooting outside this time of year - the sun isn't too bright, and you can usually rely on some good cloud coverage to give some wonderfully diffused light. Just outstanding! 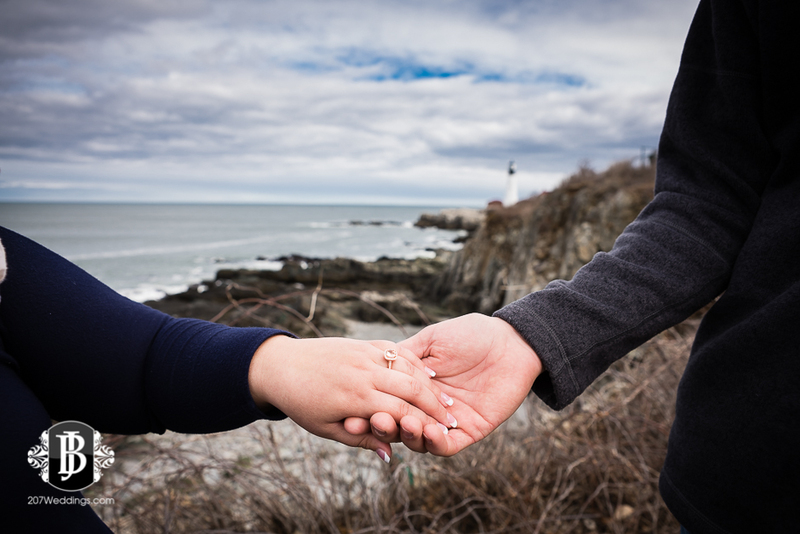 Breathtaking backdrops, √ - If you're not already aware, Portland Head Light at Ft. Williams Park in Cape Elizabeth, Maine has everything from sweeping, cliffside ocean views to wide open fields, grassy hills, birch groves and lush greenery (in the summer). A virtual gold mine for the perfect shoot, and we took advantage of all it had to offer this time of year! Adventure, √ - Climbing up and down rocky cliffs, trying to "tame" the ocean for portraits, chatting and running around the overlook until we were out of breath - It was so much fun! I absolutely love how these images turned out, and I hope you enjoy these beauties as much as we enjoyed making them!